Bloomberg View Column: A Housing Recovery Built to Last? Read my latest Bloomberg View column A Housing Recovery Built to Last?. Comments Off on Bloomberg View Column: A Housing Recovery Built to Last? 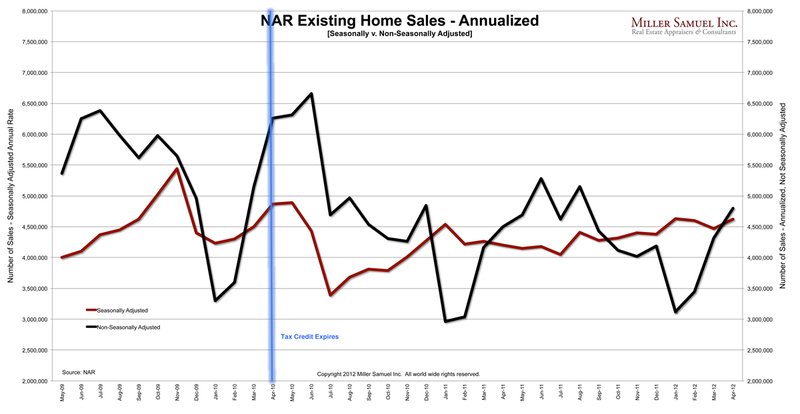 NAR Existing Home Sales Blink, And So What? NAR released their Existing Home Sales Report on Thursday with a headline that read: February Existing-Home Sales Remain Subdued that blamed the severe winter weather and low inventory for lower sales. However the recent hand ringing caused by the downshift in sales is the concern that the recovery is cooling off. I see the recent fretting about the cooling of housing as an indication of how improving conditions were based largely on Fed policy and not fundamentals. The combination of rising mortgage rates and declines from the year ago release of pent-up demand post-“fiscal cliff” likely gets price gains and sales levels in sync with fundamental economic conditions. I’ve charted NAR EHS stats from the past 4 years without seasonal adjustments. Price gains have been insane so the combination of slowing sales and rising inventory will take the froth out of the market and hopefully get us on a more sustainable path. According the National Association of Realtors, their Pending Home Sales Index fell 5.6% from August to September 2013 (seasonally adjusted), the largest monthly drop since May 2010 after the artificial prop of the 2009-2010 federal homebuyers tax credit expiration caused contracts to drop by nearly 1/3 from bloated levels. Removing seasonality from the results makes the year-over-year adjustment show nominally 1.1% higher contract volume from September 2013 than in 2012 rather than a 1.2% decline. Still, the results were weak. Why did pending sales post weaker results? Don’t blame the partial government shutdown – that came later. After the May 2013 Fed surprise announcement, fence sitters surged to the market to lock in before mortgage rates rose further, bloating contract volume over the summer (and why month-over-month seasonal adjustments to this data are so very misleading). The surge in summer sales “poached” from future organic volume that we would have seen in September so we were already expecting a slow down in volume. Didn’t we learn in 2010 what happens when unusual circumstances press volume sharply higher only to see volume fall sharply when that circumstance disappears? Weaker conditions prevail, but its really not as bad a report result as being discussed – namely because the seasonal adjustments paint a weaker picture than what actually happened, and we expected a decline in activity because the prior several months were artificially pushed higher with so many more buyers rushing to the market to beat rising rates (or the perception of rising rates). Yesterday’s release of the Case Shiller Index prompted a flurry of coverage given the 20-cities’ highest YoY increase in 7-years. I did a three way split interview from a remote location in CT (see studio set up below). I was a guest along with Vincent Reinhart, chief US economist at Morgan Stanley and Stan Humphries, chief economist at Zillow Inc. Betty Liu and Adam Johnson kept the conversation going. I especially liked Stan’s modification of the Case Shiller Index results which excluded foreclosures and his research on low and negative equity (my explanation for low inventory right now). The drop in foreclosure activity over the past year caused significant skew to the mix. According to Stan the index would show roughly a 5% increase YoY rather than an 10.9% increase. A huge difference and yet another reason why this index does more harm than good to our understanding of the housing market. Vincent’s observation that seasonality is considered in Case Shiller is basically wrong – not technically wrong because the data is seasonally adjusted. However the methodology of a repeat sales index washes out seasonality. 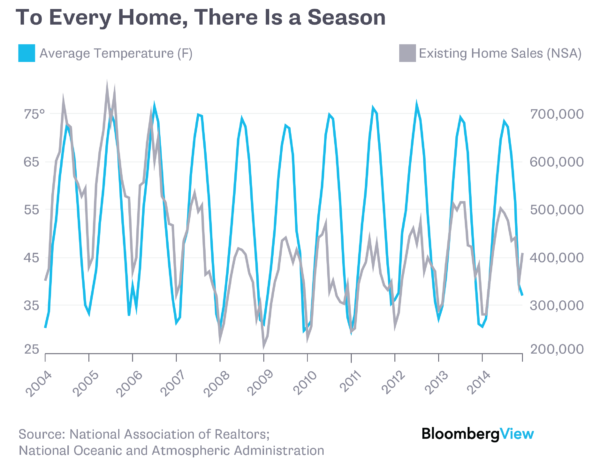 If you look at the Case Shiller chart, there hasn’t been “seasons” in housing since 1987. That’s simply not true. The Case Shiller Index does not reflect annual housing cycles. Since Case Shiller Index lags the signing of contracts by 5-7 months, expect to see much higher YoY results this summer. 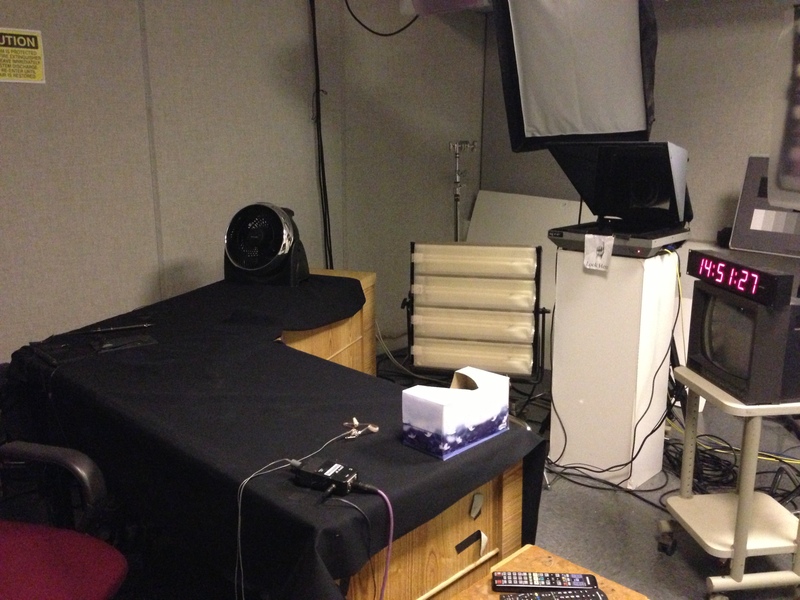 Bloomberg TV is always great to work with – they arranged for me to use a remote studio in CT through a third party. 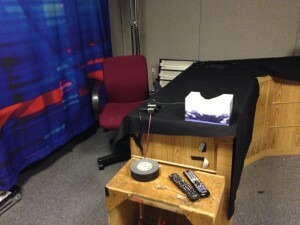 Here is what the studio looks like. Amazingly primitive but it works! 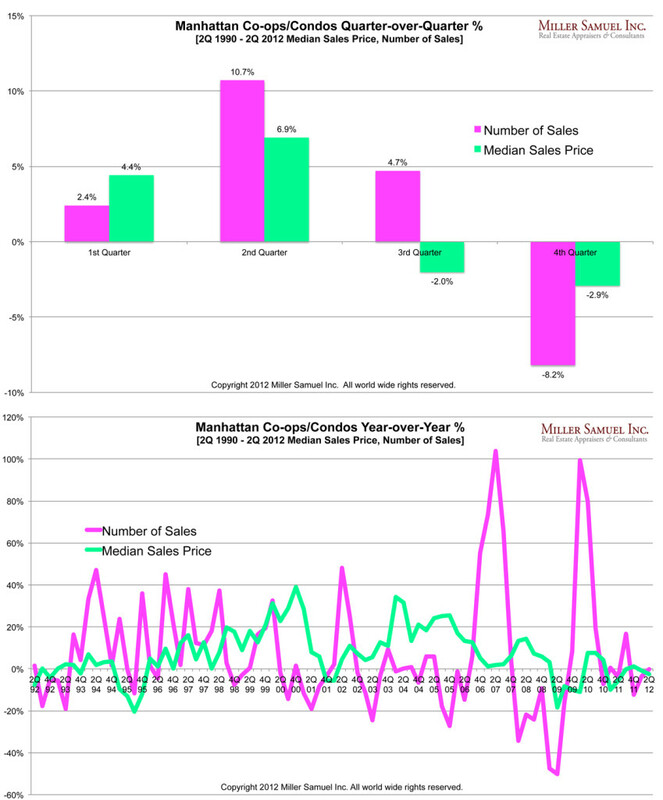 [Three Cents Worth NY #222] Is the Bottom Falling Out of Inventory? Comments Off on [Three Cents Worth NY #222] Is the Bottom Falling Out of Inventory? 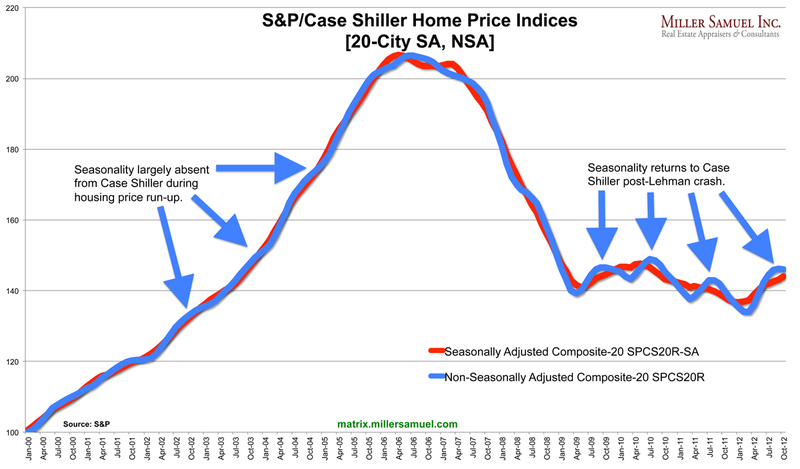 Well the frequently maligned but most influential housing metric was published yesterday, the S&P/Case Shiller Home Price Indices and the 20 City index rose 4.3% year-over-year. The only two “regions” to see declines were Chicago and New York. Baseball Correlation? Chicago and New York are the only 2 cities who also have 2 Major League Baseball teams. No, Los Angeles doesn’t have two MLB teams…the Los Angeles Angels of Anaheim are clearly trying to have it both ways. With all the talk about “recovery” (aka happy housing news) these days it just dawned on me that since 2000, the Case Shiller HPI only began to show significant seasonality since mid-2009. No one has really talked about this and I’m not sure what it means, but it just jumped out at me today. Pre-peak housing prices fueled by falling lending standards and the seasons were largely crushed by the locomotive known as the housing boom. Therefore the seasonally adjusted and non-seasonally adjusted price trends were virtually the same during the market’s ascent. I distinctly remember real estate agents commenting during this period that the seasons were going away and housing market patterns were changing permanently. Post-peak housing prices After the plunge subsided in mid-2009, the market began to ebb and flow with peaks in the spring/summer and troughs in the fall/winter. The next time CSI prices begins to smooth into nothingness, perhaps it’s a housing boom, baby. It’s time to share my Three Cents Worth (3CW) on Curbed NY, at the intersection of neighborhood and real estate in the capital of the world. And I’m simply here to take measurements. NAR’s Existing Home Sales numbers continue to edge higher. In this chart I annualize the non-seasonally adjusted and seasonally adjusted results. 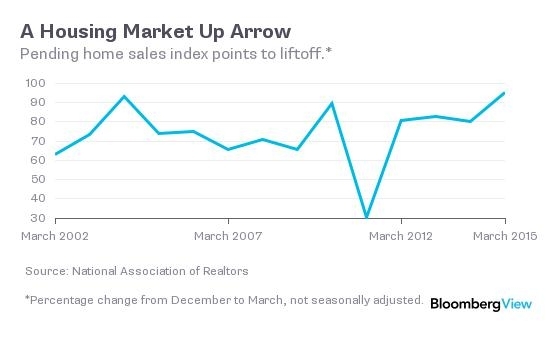 Think there isn’t seasonality in housing sales? Here’s a good summary by Peter Coy at Bloomberg Businessweek. No doubt a big reason was the improvement in affordability. The interest rate on a 30-year fixed-rate mortgage has continued falling since the period covered by the NAR report, portending better times ahead. Freddie Mac (FMCC), the mortgage-buying giant, says the rate was 3.79 percent in the week ended May 17, the lowest since it began keeping records in 1971. The Realtors’s index of affordability hit a record high in the January-March quarter. It factors in sales prices of existing homes, mortgage rates, and household income, which is slowly strengthening as the labor market improves. And here’s a trend on inventory and absorption (months supply). 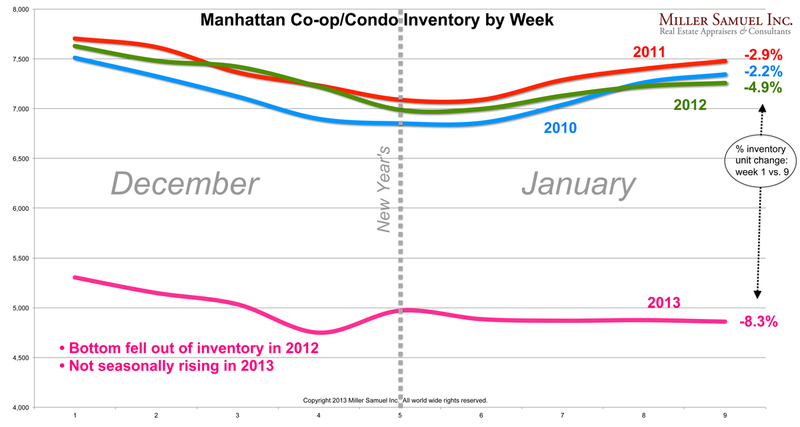 Inventory continues to slide (not seasonally adjusted). Well its been a while since I looked at the seasonal search patterns tied to real estate via Google – very cool way to parse out consumer thinking on specific topics. Clearly the surge of interest begins January 1 of each year but its also interesting to see total search volume slide since 2005. What’s even more interesting is to observe 2010 search levels, while consistent in pattern to prior years, is at its lowest level since the series began in 2004. Recovery? “Rental” follows the same pattern as the overall real estate category – strong surge at beginning of the year, sharp fall off at end of year. The decline is not nearly as pronounced as “real estate”. “Jobs” as a search term has been climbing since 2008 with some strange spikes in queries in recent months. This criteria seems to be the inverse of the “real estate” and “rental” trends. “Unemployment” shows no seasonality – only a steep climb since mid-2008. “Luxury goods” has shown a steady decline since peaking in 2005. Strange – I would have thought it would have peaked in 2007 or 2008 since credit enabled a “luxury” culture that wasn’t sustainable. “Mortgage” begain to spike in 2008 and continued in 2009 as the lending net cast by banks for mortgages shrunk considerably. I believe the low level of queries reflects the frustration associated with tight credit – that the public doesn’t think things will improve soon and therefore search activity is at its lowest since 2004 when this series began. The Westchester-Putnam Multiple Listing Service, Inc. provides a quarterly analysis of the Westchester County real estate market, a suburb of New York City. Although we perform appraisals in Westchester it’s been a while since I wrote about the market. I just did the keynote at Westchester Real Estate, Inc.’s annual award luncheon and got some great feedback from the brokers in attendance. For perspective, and aside from the last two years, annualized sales levels in 2010 are below every year since 1993. In fact, the annualized sales level for 2010 is exaggerated since the first quarter benefitted from elevated sales activity caused by the federal tax credit which will not continue to skew sales higher in the second half of 2010. Despite a 54% increase in sales activity in 1Q 2010 over the prior year quarter, sales listing inventory actually increased 3.9%. In other words, new listings entering the market outpaced the properties being sold off. 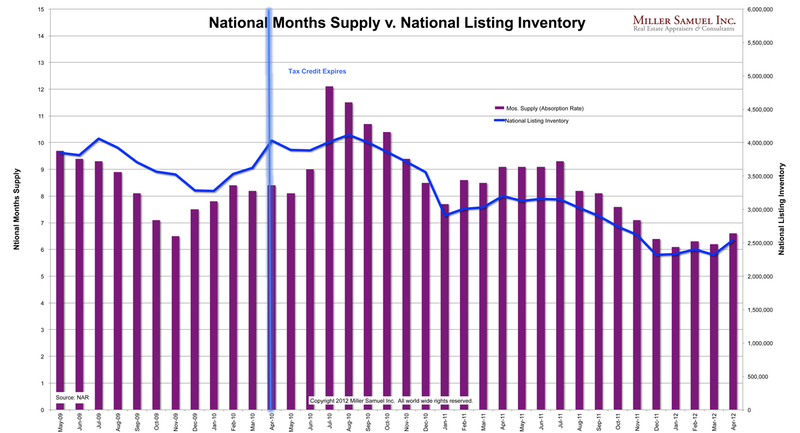 With the gains in sales, we would expect a decline in inventory over the same period. Here’s an excerpt from the WPAR report. Real estate firms participating in the Westchester-Putnam Multiple Listing Service reported 1,313 closings of Westchester residential property transactions in the first three months of 2010, an increase of 54% from the same period a year ago. Putnam County closed transactions were up by 28%. The closings largely reflected marketing and contract activity that took place during the late autumn and closing months of 2009. Although the year to year percentage increases in sales were high in all categories of housing tracked by the MLS, it must be noted that they were calculated against the very poor sales base of the opening months of 2009. At that time total sales were less than half those of the peaks posted in 2006 and 2007. The 2010 volume was closer to that posted at the start of 2008 when the real estate recession first took hold in our area. Seasonally adjusted1, Westchester’s 2010 first quarter sales were equivalent to an annual sales rate of 6,830 units; that approximate annual volume was last experienced in 1995 and 1996. The Westchester numbers for the first quarter just came out today. Even with the turbulence we’ve seen in the last couple of years, there remains a consistent trend in the median selling prices as relates to “seasonality”. Not unlike Metro-North or Hamptons rentals, there is a “peak” and an “off peak”. Whether the overall market is trending up or down, houses that close in the second or third quarters sell for considerably more than those that close in quarters four or one. Appraisals done “in season” (assuming 60 days from contract to closing, these would be valuation dates in the six months between February 1 and July 31) should rely, if possible, on sales that closed in the second and third quarters, if not from the year of the appraisal then on the prior year. Conversely, appraisals made between August 1 and January 31, or “off season”, should focus on sales from quarters four and one. Adjustments are required for the difference in market conditions between “in season” and “off season” for single family houses in the New York metropolitan area. 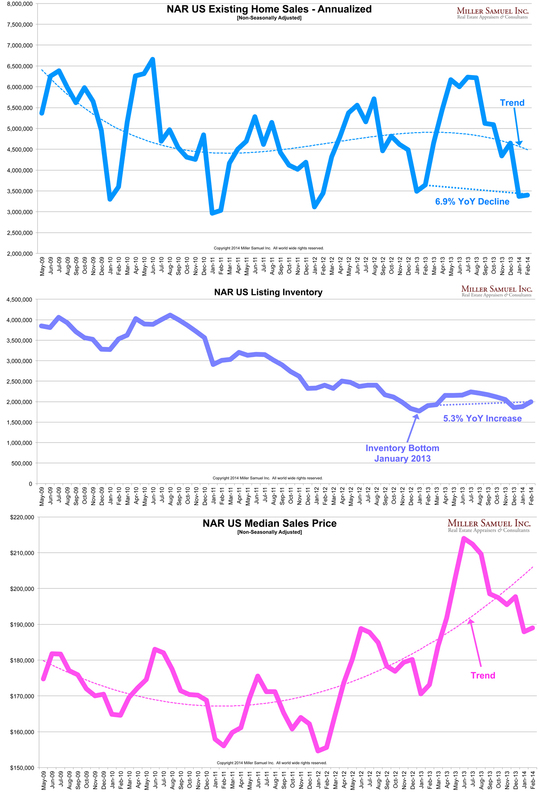 What those adjustments should be can be fairly easily calculated by looking at the historical data for median prices. Remarkably, in Westchester at least, the differences are pretty consistent either in upward of downward trending markets. Check out that serpentine line on the Median Price chart – just for fun, print it out and draw a line connecting only quarters two and three to each other over the years. Then do the same to quarters four and one and watch how quickly that serpentine line straightens out into two lines with much more of a consistent trend to them. I really don’t understand why appraisers are so stuck on this idea that only sales taking place within six months of valuation date should be used. Six month old sales can be the most misleading ones of all, insofar as market conditions are concerned. p.s. I know I addressed this issue in a prior post but it bears repeating since it seems almost no one is paying any attention.